East Cowes passenger and car ferry ticket prices, timetables, ticket reservations and information for ferries sailing from East Cowes to Southampton. Compare all available East Cowes ferry ticket prices in real time and book the cheapest available East Cowes car and passenger ferry tickets sailing to and from East Cowes, Southampton with Red Funnel Ferries or Hovertravel ferries online with instant confirmation. Book East Cowes Ferry Tickets with Red Funnel Ferries or Hovertravel for ferries sailing from East Cowes to Southampton online in advance to enjoy the cheapest available ferry ticket price. The price you see is the price you pay. There are no hidden extras or surprises such as added fuel surcharges or booking fees and we do not charge you anything extra for paying with a Visa Electron card. The price we quote you for your selected East Cowes passenger or car ferry ticket, onboard accommodation and vehicle type is all you will pay, and that's a promise. To obtain a East Cowes ferry ticket price and book your ferry ticket securely online please use the real time ferry booking form on the left. You are also able to add a hotel at your destination, or anywhere else, to your ferry ticket when completing your ferry ticket reservation. East Cowes is on the east bank of the River Medina, directly opposite West Cowes. The two are connected via a chain ferry shuttling both passengers and cars across the tidal river. East Cowes is the Island port for all vehicle traffic to and from Southampton and is a vital artery to the Island's economy. Queen Victoria used to holiday here with her family and when her husband Prince Albert died, she made the Island her main home. Osborne House is now owned by English Heritage, given to the State by Edward VII. East Cowes is the home of Red Funnel Car Ferries. They shuffle back and forth to the mainland, travelling up Southampton Water, where they dock approximately 15 minutes walk away from the main shops. Another ferry offers communications across to East Cowes, and that is the floating bridge, a chain link ferry which runs across the Medina, between Cowes and East Cowes. East Cowes has long been established as one of the major industrial areas of the Island. It was the home of British Hovercraft for many years and the large sliding factory doors on the shore, painted with the Union Jack, adorn postcards and are often one of the first major landmarks visitors see. Westland’s, who now own the site, have digressed into other fields and much of the former shoreline which was used for ship building and industry is being re-developed with marina facilities and luxury properties. East Cowes is fast re-generating itself from an industrial area into a major yachting facility. Also at East Cowes is a long promenade which allows you to have a stroll and watch the boats battle for position as they enter and leave the mouth of the River Medina. East Cowes also has a castle - Norris Castle - and it was this, which Princess Victoria visited, that started her love for the Island. When she couldn’t buy it she settled for Osborne. Next to the main house (of Osborne) is Barton Manor, which was a medieval manor, used by Prince Albert as an experimental farm. Though it is not open to the public now, the gardens are open on various dates throughout the summer, raising much needed funds for The Earl Mountbatten Hospice. St. Mildred’s Church at Whippingham was the church favoured by the Royal family when they visited and stayed at Osborne. Located on the right hand side as you are leaving East Cowes, this superb and ornate structure is a “must to see”. The detailed stone work and interesting features are fascinating. The name Estcowe (East Cowes) originally comes from one of two sandbanks each side of the River Medina estuary, so called after a supposed likeness to cows. The name was subsequently transferred to fortifications built during the reign of Henry VIII on the east bank to dispel a French invasion, referred to as cowforts or cowes, which subsequently gave the name to the town. The naming of Cowes was done in a similar fashion. They replaced the earlier name of Shamblord. The settlement of Shamblord at East Cowes was first recorded in 1303. It grew as East Shamblord, and became a much more significant settlement than the Western Shamblord. As the Isle of Wight was the target of frequent French invasions, with some notable incursions, the fort built at East Cowes was later destroyed and should not be confused with East Cowes Castle built subsequently by John Nash. During the reign of Queen Victoria, who made her summer home at Osborne by acquiring and rebuilding Osborne House, East Cowes was the subject of planned estate of grand houses, groves and parks. The scheme, not finding the finances it needed, was folded, but a few residences built in the early stages still survive to this day such as the former Albert Grove residences of Kent House and Powys House on York Avenue. In East Cowes Norris Castle was designed in the Norman style by James Wyatt in the late eighteenth century. The building survives and today remains a private home. In 1798, the architect John Nash, began building his home, East Cowes Castle, where he later entertained the Prince Consort and other prominent guests. East Cowes Castle was notable for its Gothic towers and turrets, and elaborate castellation. Nash died in 1835 and is buried in the tower of East Cowes Church which he also designed. East Cowes Castle was demolished during the 1960s, although the ice house remains and is visible in Sylvan Avenue. Cowes and East Cowes became a single urban district in 1933. During World War II, both Cowes and East Cowes became the targets of frequent bombing due to its industry and proximity to Southampton and the Royal Navy's home at Portsmouth. The shipyard of J. Samuel White was badly damaged by air attack in early May 1942 but, when rebuilt, innovative ship construction methods had been introduced. The first warship completed by the renewed yard was HMS Cavalier. During the air raid, the local defences had been fortuitously augmented by the Polish destroyer Blyskawica (itself built by White's), which put up such a determined defence that, in 2002, the crew's courage was honoured by a local commemoration lasting several days to mark the 60th anniversary of the event. Later in 2004, and over to the west, an area of Cowes was named Francki Place in honour of the ship's commander. To celebrate the Silver Jubilee of the Queen's coronation in 1977, the main hangar doors of what was then the British Hovercraft Corporation (a successor to Saunders Roe) were painted with the world's largest image of the Union Flag, which can still be seen today. Best Price Guarantee - We always offer you our lowest available Red Funnel Ferries or Hovertravel passenger and car ferries ticket price to and from East Cowes. There are no hidden extras or surprises such as added fuel surcharges or booking fees and we also we do not charge you anything extra for paying with a Visa Electron card. The price we quote for your selected East Cowes ferry ticket, onboard accommodation and vehicle type is all you will pay, and that's a promise! In the unlikely event you find the same all inclusive East Cowes ferry ticket cheaper in the brochure of any other tour operator we promise that we will do our best to beat that price or offer you the choice of requesting a refund. 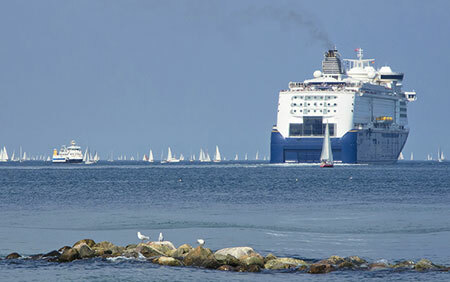 To book East Cowes car and passenger ferry tickets please click here. At ferryto.co.uk you are able to obtain live East Cowes ferry ticket prices, check availability and book car and passenger ferry tickets to and from East Cowes at our lowest available ticket price. Ferryto.co.uk is part of the world's largest online ferry ticket distribution network providing the ability to book over 80 major European ferry operators including to East Cowes and to over 1,200 other ferry routes throughout the UK, France, Spain, Ireland, Holland, Eastern Europe, the Mediterranean, the Baltic and North Africa.